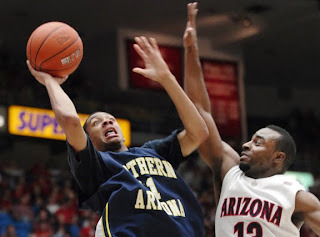 In case you missed it, Northern Arizona Guard Gabe Rogers will miss at least the first couple months of the season, and maybe more, as he has a torn labrum. Junior guard Gabe Rogers, who averaged 13.1 points per game last season, had surgery Monday to repair a torn labrum in his right shoulder. "You never know when life's going to deal you a crooked hand and you're going to have to figure something out," NAU coach Mike Adras said. "It's unfortunate, but it'll make Gabe better. ... We're going to have to figure out what to do now, that's just the reality of where we're at -- somebody else will have to figure it out now and grow up a little quicker than expected." Rogers is one of the best shooters in the Conference and in America, and I thought he could be a first team All Big Sky performer. He was going to be a huge part of what the Lumberjacks did, as he was the leading returning scorer after the graduation of Cameron Jones. - James Douglas and Danny Cheek will have to grow up fast. I thought Cheek could get a lot of time and Douglas would play a more limited role as a freshman, but both could see a lot of minutes early. James Douglas has reportedly looked excellent so far this year, and Danny Cheek was very highly touted. If those two can gain valuable experience, NAU will be that much more explosive when Rogers returns. - Stallon Saldivar could lead the Big Sky in assists. He posted one of the highest ARates in the country last year, and should handle the ball even more without Jones or Rogers to control the offense. He won't score much, but he creates a lot of opportunities for other guys..
- It will be a balanced attack. Northern Arizona's roster consists of 10 guards and 5 forwards, so they will be a run and gun attack one would assume. With no stars, a lot of guys should see time, and they will need different guys to step up and put points on the board. Mike Adras is one of the best coaches in the Conference at plugging guys in, and he will need to do some masterful work early this season without Gabe Rogers. If he can weather the storm and get the young guys to grow up quickly, NAU will be dangerous down the stretch. At the very least, with their roster configuration, they should be a lot of fun to watch!